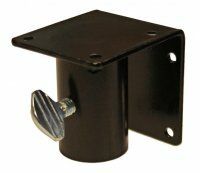 Nesting box flange plate for either top or side mounting. Perfect for bluebird houses. It's often used on our appropriately sized 60" Tubular Pole: FP3NF Tubular Pole 2"H x 2"W x2"D.
Note: Taller poles are recommended if the your bluebird house needs a predator guard.